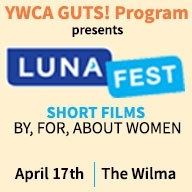 LUNAFEST, the fundraising film festival dedicated to promoting awareness about women’s issues, highlighting women filmmakers, and bringing women together in their communities, will be hosted by YWCA Missoula’s GUTS! program. The evening will eight short films by women filmmakers, raffle, silent auction, and special performance by GUTS! girls. The films range from animation to fictional drama, and cover topics such as women’s health, body image, relationships, cultural diversity and breaking barriers. Proceeds from LUNAFEST will benefit the GUTS! Program. Girls Using Their Strengths (GUTS!) is a unique, community-based leadership and empowerment program designed by and for young women and gender diverse youth, ages 9 to 18. GUTS! encourages youth to explore their own personal values and discover their strengths through outdoor adventures in the summer, as well as after-school groups and skilled trades workshops during the academic year.